John Susi has had a life that could easily be the envy of any music fan. Having spent most of his adult life working for the legendary Colorado music promoter Barry Fey, he has come in contact with a literal who’s who of rock-n-roll music. It probably would have never happened, if it hadn’t been for the Electric Prunes. 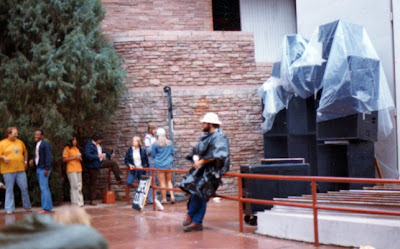 After effortlessly bringing in Marshall speaker cabinets by himself, the band asked if he wanted to be their roadie. He jumped at the chance. 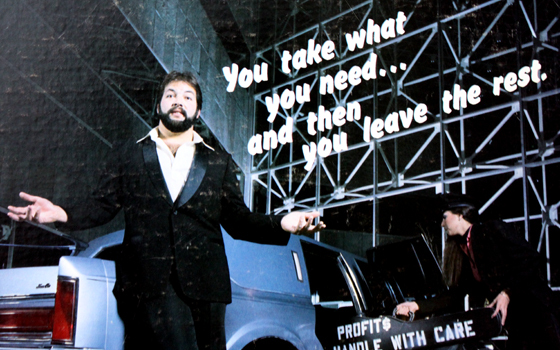 "The Electric Prunes eventually lost their record deal and broke up. That led to my working with Sugarloaf,” he said. “They needed a guy to go on the road with them, to lighten the load of their road manager Keith Rhodes. This was during the band's work on their second album--but when the shows ended again, I had no gig. So Susi went back to Morrison, and back to Bear Creek High, and at the age of 20, graduated. Then, as fate would have it, another chance meeting would change his life again. Susi joined the ranks in the exclusive Feyline Peer Group Security Force, otherwise known as the Goon Squad – working crowd control and neutralizing the gatecrashers. After several years protecting every band Feyline promoted, Susi himself was promoted. “I started doing ticket outlet work, distribution, delivery, and then after that, I moved to stage production. All the big stadiums shows, I was a part of. Susi’s life wasn’t always on the other end of the stage. Before he hooked up with Barry Fey, he too was a performer. “When I was 15 my friend Michael Frazier had a band, Commercial Appeal. I tried out as the bass player and got the gig. Fast forward ten years and Mikey and I meet up again. This time I wanted to play guitar,but was self taught and dumb as a box of rocks, but I had written a few songs. Mike had his challenges, but he taught me anyway. We then put together a band, Hundred Acre Wood." Hundred Acre Wood also included drummer Paul Folis and bassist Troy Taylor. Armed with a new rhythm section with impressive credentials, including Loggins & Messina's Merle Bergante on drums and Larry Sims on bass, the rest of the group included Al Garth (the Eagles), John McEuen on banjo (Nitty Gritty Dirt Band), keyboardist Pete Wasner (Vince Gill), and guitarist/vocalist Jerry Stringer. The new Hundred Acre Wood headed to Applewood Studios in Golden. In spite of not having a record deal, Hundred Acre Wood would get some airplay on KDKO radio, Denver’s soul station. “We released a reel tape of our music to radio stations. Doctor Daddy-O heard our song 'Thoughts of a Woman,' and played it on the air. The phone lines went crazy. He called us to do an in-studio interview, and when we got to the station, the receptionist was wondering why these white guys were in the lobby – they had no idea that Hundred Acre Wood wasn’t a black band. Even with the response of radio listeners, there was no money to keep everybody going and Hundred Acre Wood broke up." About this time Susi wanted to put down his acoustic guitar and rock out. While keeping busy with Feyline, he continued writing music. The subject matter was plentiful, being surrounded by rock stars for inspiration. 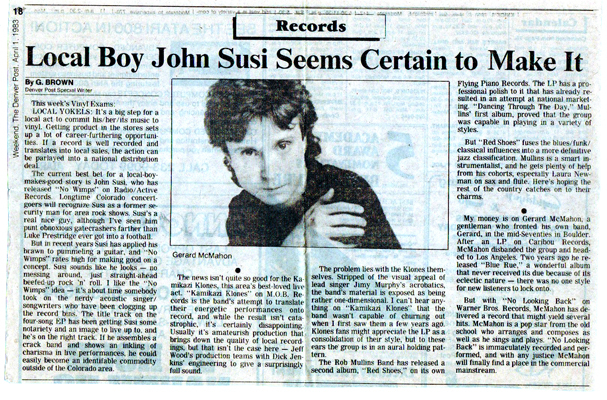 “I had been doing a bunch of shows with Aerosmith and there was a lot of talk about Steven Tyler at the time – his sexuality, behavior and vices, all that kind of rock star stuff. I was tired of hearing it. Everybody wants to take a shot at someone on the top." 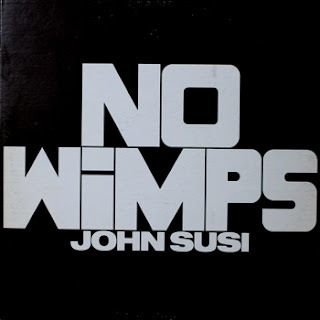 The result was the song “No Wimps.” In 1983, armed with a title cut and other songs, Susi headed to Applewood Studios to lay down tracks for an EP. He was joined by his friends Michael Pfeifer on guitar and drummers Merle Bergante, and Bob Baugh (Bad Bob). Rounding out the band were Ian Campbell and Gary England on bass, and Peter Parks and David Zychek on guitar. The release caught the attention of The Denver Post music columnist G. Brown, as well as local radio stations KAZY, KBPI, and KBCO. 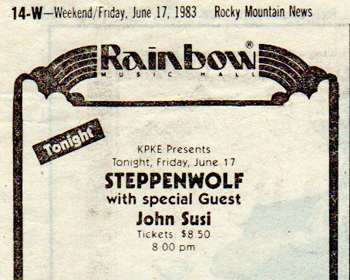 After putting John Susi on the bill, the stalled Steppenwolf sales picked up, and the show sold out. “We ended up in Billboard, as one of the highest grossing shows in the nation that week. But again the money just wasn’t there to keep us going. After playing with Steppenwolf, Michael Bolton, and Savoy Brown we had been booked to open for Leslie West, Joe Walsh and the Neville Brothers, but we still couldn’t make enough cash for expenses and a living. We all had to have other jobs to stay alive, so the band broke up." In between making music and guarding rock stars, Susi discovered another passion – wine. 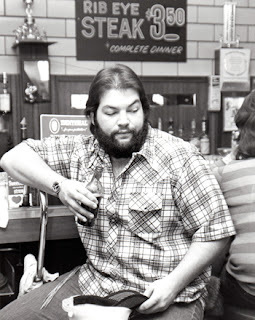 “I was working security for Alice Cooper, during the Billion Dollar Babies tour, and was used to Budweiser and Jack, and really bad concert wine. This gal took me to a wine tasting, and that was it. I started traveling to Northern California to learn about wine, and spending a lot of time at wineries. Then I started making it." After serving the fruits of his labor to friends and family, he discovered that tasters wanted to buy it. 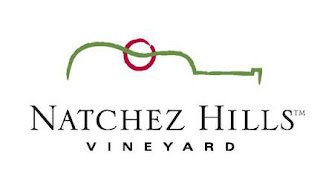 So he opened Raven Hill Winery, in Bailey, Colo.
“I then moved to Conifer and started J. Susi Winery. I would still be there today, except the lease expired on the property, and they sold it, and the new owners didn’t renew it. I was devastated. So I got in my car, filled it with my wine, and went to every winery I could find along the way. I found Natchez Hills, and fell in love." Now making his home in Hampshire, Tenn., Susi says the move was a perfect fit, as the winery holds regular live music events on both indoor and outdoor stages, and even has a recording studio. However you won’t find him standing guard at the stage--but he will ask for your ID should you want to taste the wine.